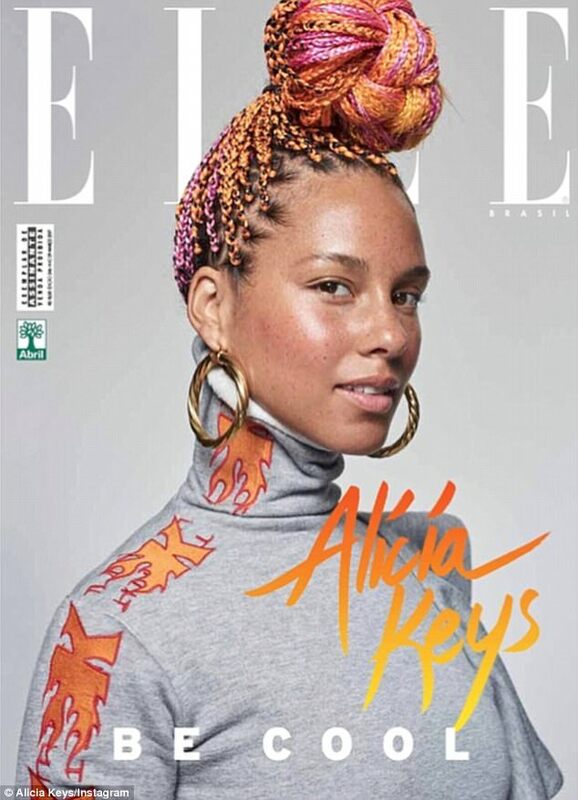 Alicia Keys posed for her first Elle Brazil cover - not once but four times. And the 36-year-old singer did the shoot with the minimum of make-up, after launching the #nomakeup campaign last year to encourage self-acceptance. 'It can seem silly, but I think that many of us are caught in this trap. We worry about what the others are thinking about us, and we forget to think by ourselves. Actually, this is not only about using makeup or not. It is more about living, being as you feel really comfortable and exploring all of it,' she explained in an accompanying interview for the publication. The singer rocked her new flame-colored braids as she modeled four very different styles for the latest edition of Elle Brazil. The 36-year-old shared them all on her Instagram page, captioned: 'Thank you @ellebrasil for capturing my true colors. Can't wait to come to Rio and feel all that magnificent energy,' and adding lots of heart emojis.